While driving into the office this morning, I heard on NPR that our Big Time Principal Gift Prospect has been charged with racketeering. Of course, she denies the allegations and will fight the charges. Our president just solicited her for a naming opportunity ― the Business School, no less — and the gift agreement is undergoing modifications now. The optics on this are not ideal, to say the least, and this gift was going to be a lead gift for our capital campaign. I don’t want to be the bearer of bad news. What should I do? Ah! We’ve all been there — truly. Just follow the procedure for handling sensitive information that your organization has surely already outlined in your procedures manual. Research. No matter where you learned about any criminal activity, use your research skills to confirm the current state of the allegations. State the facts. Fact: Big Time Principal Gift Prospect has been charged with racketeering. What are the other facts? What is the possible timeline in terms of clearing her name or moving forward with prosecution? If you do not have this direct line of communication with the applicable colleagues, go directly to your supervisor and explain what you’ve learned. Your supervisor should guide you on next steps. You may only play a supporting role in this case, but this should be part of your department’s mantra: If you learn something, say something. Don’t presume this information is widely known. Also, don’t gossip. These are real people ― the prospects we research — with real lives and real problems. While you are absolutely correct in worrying about mitigating risks for your organization in terms of accepting a naming opportunity gift from someone undergoing criminal investigation, it is also important you continue to protect your organization by refraining from idle work-related gossip. Then what? Let’s presume the charges stick and the proceedings take years to come to resolution. The relationship with your organization during that time is not yours to determine. It is likely the decision to name the Business School for the Big Time Principal Gift Prospect will be at least put on hold. It is also likely the Big Time Principal Gift Prospect will self-select, as there are more pressing matters requiring her attention. What if you are tasked with researching a prospect and discover time served for a violent crime? Or you research a prospect and learn she was publicly accused of plagiarism in major national publications? Or you research a prospect and learn he was presumed guilty by the media but cleared of a crime in a court of law? 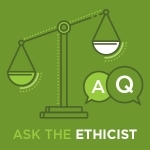 The Ethicist still suggests you research, state the facts, document and inform. Monitoring and updating such information may not be necessary since this criminal activity information is in the past for your prospect. Past or present, violent or financial criminal activity — if you conduct your due diligence and stick to the facts, your organization, and your career, will be all the better for it. And please, create a guideline for handling sensitive information. No one should have to guess what should be done in the future.